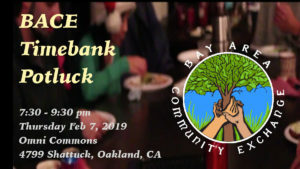 Join fellow Timebankers for our first potluck of 2019! Catch up in person with Timebankers you know and get to know some new Timebankers. Volunteers will unveil some BACE Timebank goals and plans for 2019, and you’ll have an opportunity to share your ideas for improving the Timebank for all. Everyone is welcome, even if you are not yet a timebanker. Bringing food is optional, but let us know if you are bringing something at the time you RSVP to the invitation. To find us, enter the Omni Commons building on the corner, then go up the stairs on your left. We’ll be in the Disco Room. To RSVP sign up on our Meetup page here.